That's Yellowstone County Attorney Scott Twito testifying at the Montana Meth Summit. Participants said the drug has a stranglehold on state law enforcement, public health, tribal communities, and the court system. Montana battled meth more than a decade ago with some success, using public awareness campaigns and cracking down on local labs. Since 2010, meth has surged back. Police agencies say it's now primarily supplied by Mexican cartels. To make matters worse, they say the meth is now stronger and cheaper. For four hours Saturday, people dealing with Montana's meth crisis shared experiences and proposed solutions. "We could do a significant amount of work on the interstate system with getting this stuff before it gets into the communities. I would much rather be that were stopping 20 lbs of meth on the interstate then dealing with all of the aftereffects and when that gets into Missoula, Billings or Helena." At present, Governor Steve Bullock's budget proposes cutting $7.7 million from the state Highway Patrol over the next two years due to declines in state revenue. Several panelists said meth offenders are already paralyzing the state criminal justice system, flooding jails and choking the courts. Bryan Lockerby, with the Division of Criminal Investigation, looked to another approach. "There are many people involved in this who simply need treatment and want to get off meth, we recognize, from an enforcement standpoint, that issue and we support it," Lockerby said. At the heart of Saturday’s discussions was the need to rethink criminalization of drug offenders and focus on helping them manage their addictions. Montana Lawmakers and state agency officials convened a 'meth summit' in Helena Saturday. The second panel on family and community impacts made clear that resources for treatment are lacking. "If you really want to look at what the system needs, we certainly need more providers and more access to providers, we also need care provided in integrated settings, meaning that where you get your primary care, you can also get care for your mental illness and addiction," Wernham said. 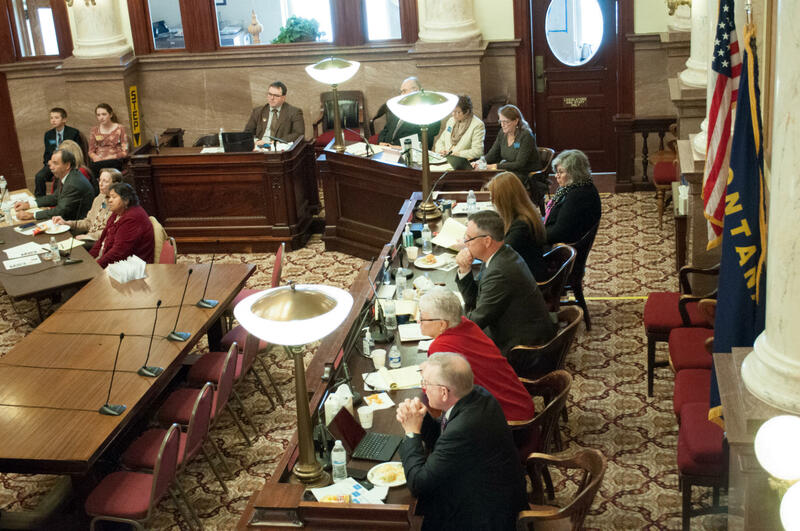 Last week a legislative committee rejected a proposal to spend $400,000 to train more doctors in Montana and to establish a residency program for psychiatrists here. There are tremendous healthcare costs. Hospitals and emergency rooms in the state have been billing more than $140 million annually in recent years for meth and substance-abuse related patients. Of that total, $28 million was charged to Medicaid. The Department of Public Health and Human Services also pointed to meth as a major disrupter in the home. Laura Smith is with the Department’s Child and Protective Services division. "The percentage of cases in child and family services that involve drugs is 65 percent," Smith says, "and then of those, 65 percent involve methamphetamine." The panel painted a grim picture of meth's assault on families, particularly the drug's power over addicted parents, who neglect their children for days on end while riding a high. "Treatment, treatment, treatment and access to mental health services for kids and adults is crucial to not having this seep down into the kid population," McLaughlin said. A third panel on tribal impacts included Bryce Kirk, who runs a peer-mentor program with his wife on the Fort Belknap and Fort Peck reservations. Kirk dealt with meth addiction in his past and said his experiences are valuable in deterring new users. But his frustration comes from poor communication and collaboration between reservations and the state. "Meth has no boundaries," Kirk says. "A reservation has boundaries, meth don’t. We have to come together, we have to be unified, we have to be able to put our pride aside to say, hey man we need to get this going; we need to figure this out." Kirk said Medicaid certification of his peer-mentoring program would boost funding. "Literally last night, the last committee voted, so Senate Bill 62, it does create a certification for peer-support. We’ve done that part, it’s on the way." The final panel of the day dealt with Montana's judiciary and corrections systems and the caseload bearing down on its workers. Panelists said meth users bog down the system, committing multiple crimes in order to feed their addictions. Testimony from the Department of Corrections and from the District Court reinforced the need to shift cultural views of criminality. "The Department of Justice is studying these issues, we're working with the Montana Healthcare Foundation and we'll be doing some town halls and a summit later this year to generate the kind of information that we can then provide to the policymakers, our legislators, the governor's office, and even the federal level as well, to begin to make better decisions putting resources where they can be most effective."